Patterning is fundamental to mathematics because all math are virtually patterns and structures. Mathematical relations and transformations result in patterns and abstraction. It is therefore critical to children’s development of mathematical reasoning. The integration of patterning in children’s early learning can promote such development. There are many types of patterning: written symbols (e.g. ABCABCABC…), numerical (e.g. 1, 3, 5, 7, 9, …), color (e.g. red, blue, red, blue, …), shapes (e.g. a sequence of triangles) and many other properties. In this project, we will be playing with shape patterns using popsicle sticks. 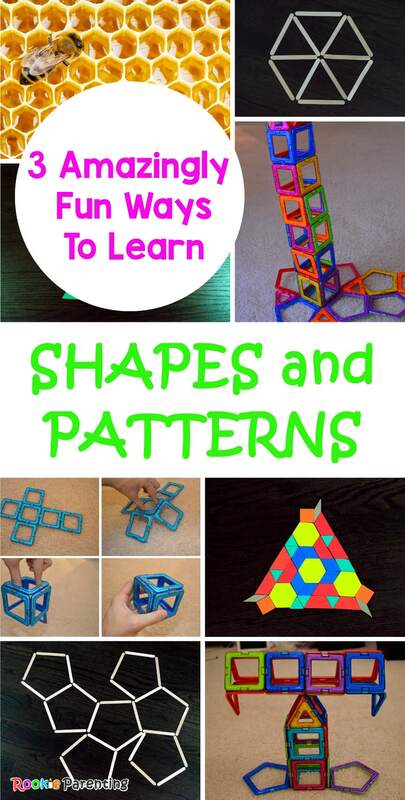 I love this activity because kids can learn how to create patterns from scratch and visualize how shapes are stacked together to form different patterns. And this game doesn’t cost a lot. I got them from the dollar store. You can also buy the craft sticks in bulk online and have them shipped to you. 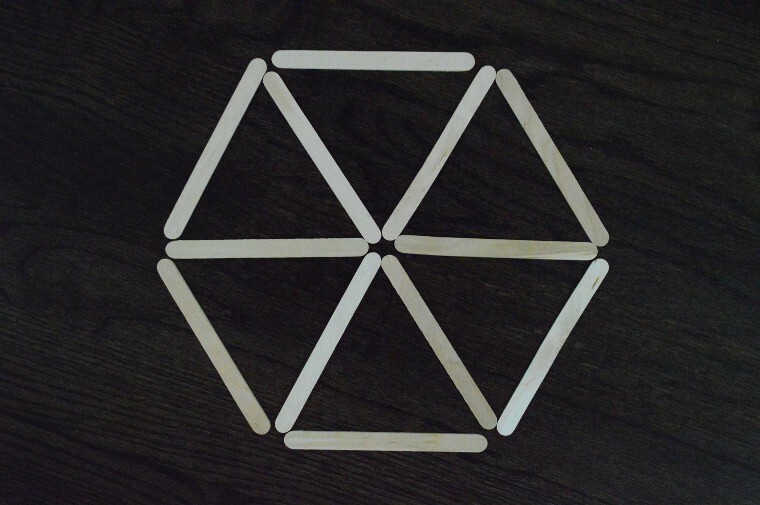 Using popsicle sticks, you can build many closed shapes with sides of equal length. We started with triangles. Triangles can be made from sides of different lengths. When all 3 sides have equal length, they are called equilateral triangles. Stacking equilateral triangles together creates a bigger equilateral triangle. 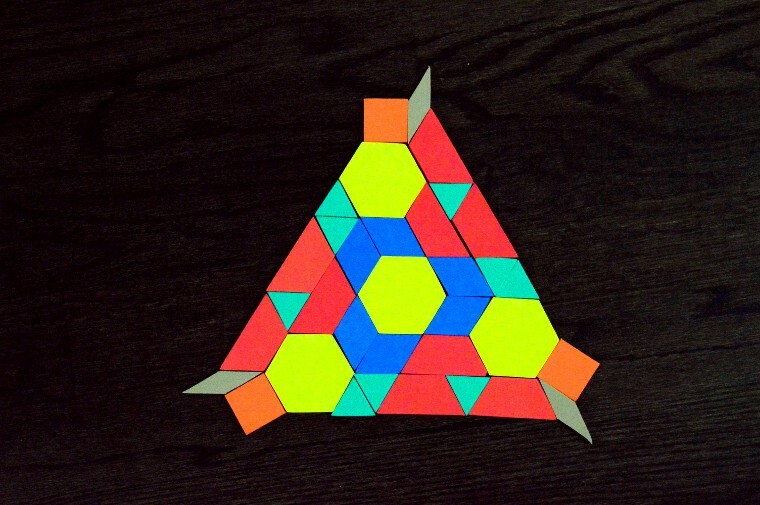 Some triangles are flipped upside down to stack tight together. There’s no space between adjacent triangles. Next, we tried to build shapes with 4 sides: squares and diamonds. 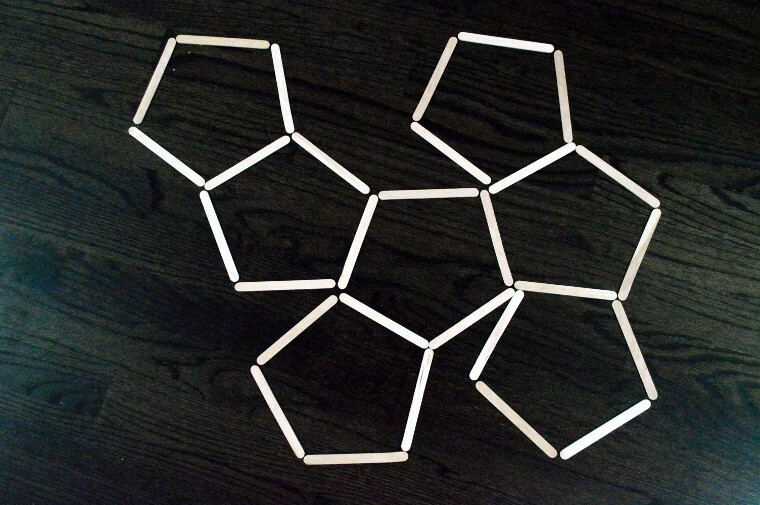 You can build more than 1 shape using 4 craft sticks by varying the angles between two adjacent sticks. You can stack diamonds in more than 1 way to create different patterns. There’s no space among shapes. Not all shapes with equal sides can be stacked tightly with no space in between. Pentagon cannot be stack on flat surface that way (although it can be in 3-dimensional stacking). Some patterns can be found in nature. The honeycomb inside beehives has a characteristic hexagon pattern. Why do bees decide to build hexagon over other shapes? They fit together tightly without wasting any space between shapes. They have equal sides so that every bee can work on different parts of the honeycomb easily. Among all the shapes that meet the above two requirements, i.e. triangle, square, diamond and hexagon, hexagon is the most compact. It requires the least among of honey wax to create. Here is a more detailed explanation and a vigorous mathematical proof for those who are super math-included. 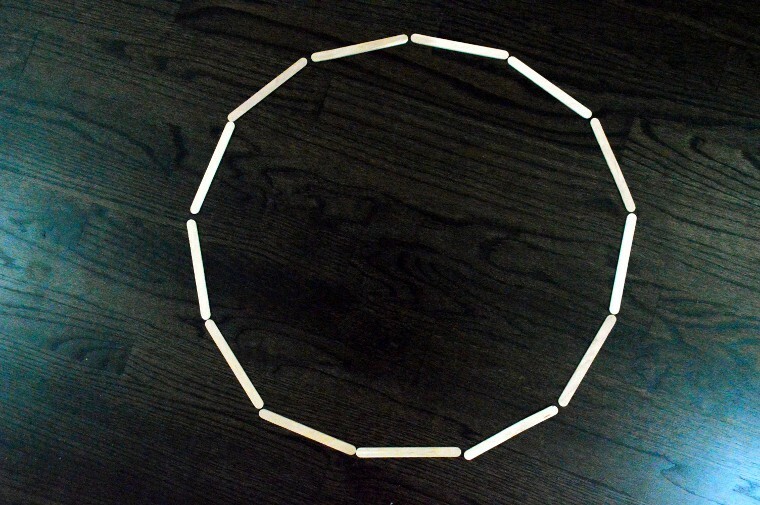 Finally, it’s worth noting that using many craft sticks, you can build a shape resembling a circle. Another good tool to encourage young children to learn shapes and patterns is pattern blocks. These a a bit pricier than the craft sticks, but they can create many different games and can last for a long time. Here are some games for toddlers to get familiar with geometric shapes and their spatial relationships. Show them how to create a bigger shape using smaller pieces. For example, 2 small triangles can make a diamond. 2 squares make a rectangle while 4 squares create a bigger square. 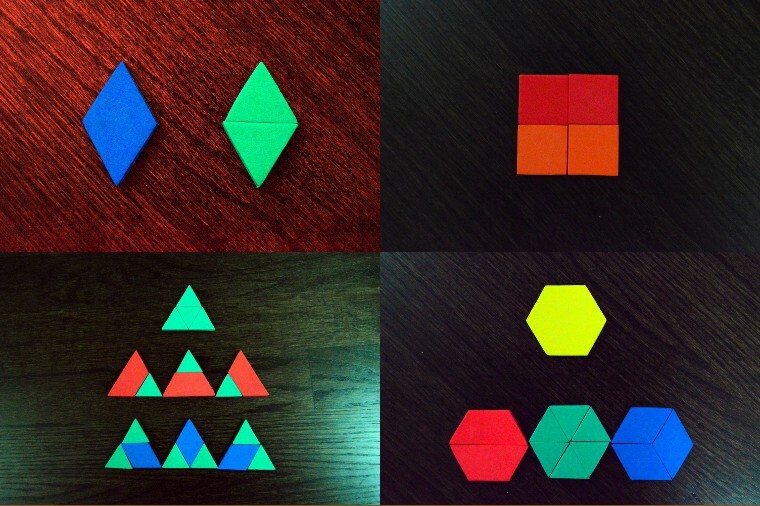 Challenge your child to find as many combinations as possible to create a bigger triangle or a pentagon. Pattern blocks are fantastic educational tool because you can create endless patterns. Create one yourself and ask your toddler to follow and copy it. Research shows that such block copying activities can significantly increase kindergartens and first-graders’ math scores. I don’t like buying expensive toys. I think it’s important to teach children the difference between essential and luxury items. We need food, but we don’t need toys. We want toys. We can always find something fun to do without spending a fortune. However, I did splurge on Magformers. 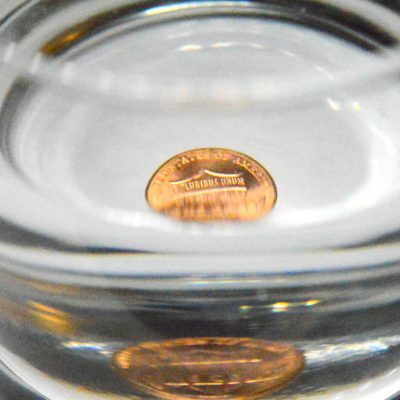 These are building plates with magnets. They can stick together to create 3-dimensional structures. I simply couldn’t replicate this one easily using other cheaper toys. With the rate we’re playing them (everyday), it turns out to be worth it. Wait for a sale to get a discount as they are pricey! There are other brands of magnetic tiles such as PicassoTiles and Magna-Tiles. 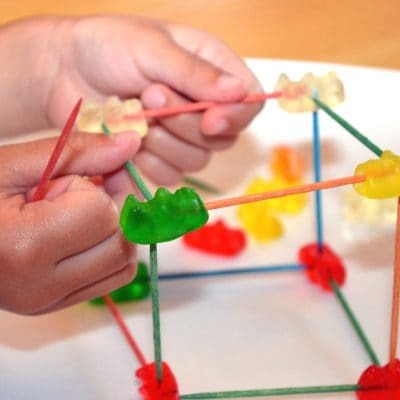 But I like Magformers the most because you can clearly see through the structure and visualize how it’s constructed. 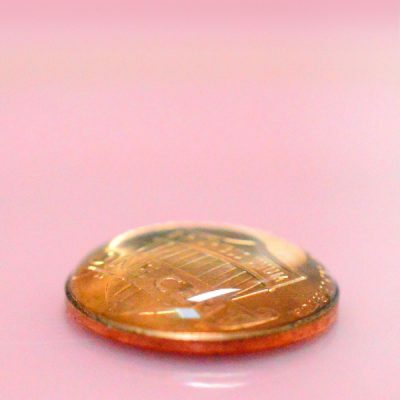 The “holes” in the middle also make the following 2D to 3D transformation possible. Lay the pattern as shown below flat. Use two fingers to pick up the second piece (“middle” of the cross) until the adjacent pieces flip and stick together. Violà! 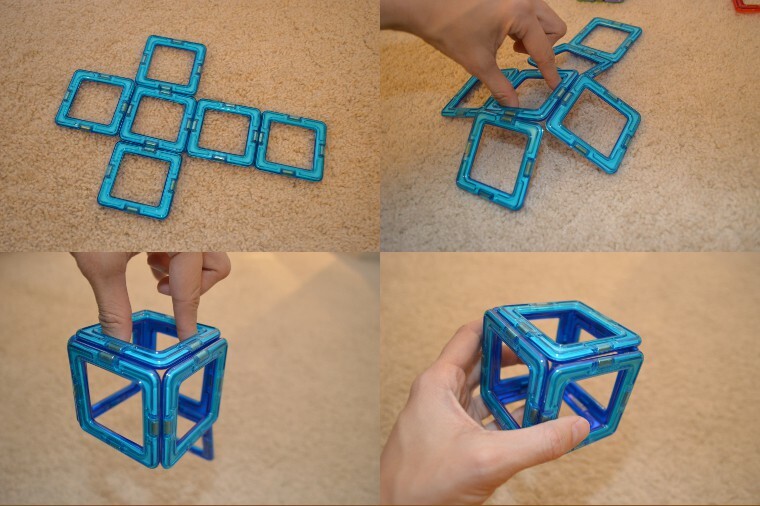 That’s how a 2-dimensional cross turns into a 3-dimensional cube. You can do many pattern activities with Magformers. 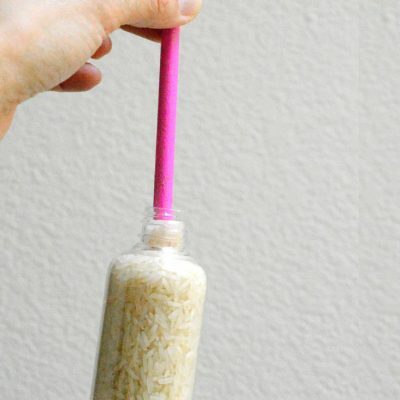 You can also go further to teach your child some STEM concepts as they grow older and understand more about structure. Magformers are a bit like Legos. You can buy different sets to get more different shapes and more pieces. (And like Legos, they are expensive). Run a competition. See who can build the tallest structure or create a balanced scale.